2010 was a rough year for Chile… so it seems only fitting to start 2011 fresh with a wine that evokes hope and light for the new year. When you think about food & wine pairing, do you think about the occasion as well? I do. So when I was choosing the first wine we would drink on 01/01/11, I wanted it to be meaningful. I checked through all the special wines in my “cellar” (ok, so it’s a closet) for just the right one. It had to be Chilean—my heart, soul, and life are here. I love Chile, and I love its wines. I wouldn’t dream of kicking off the new year with anything BUT a Chilean wine! I considered the different icon wines: Almaviva, Lapostolle Clos Apalta, Errázuriz Don Max, Viu Manent El Incidente, Tarapacá Tarapacay, Canepa Genovino, San Pedro Cabo de Hornos, Seña, Concha y Toro Don Melchor, Cousiño Macul Lota, Errázuriz Kai… there were many to choose from, all excellent, many that truly evoke Chile, not only in vitivinicultural terms, but in the emotional, cultural, and historic sense. I finally narrowed it down to two: VIA Wines Chilcas Las Almas Carmenere 2008 and Antiyal 2007. Las Almas is a Carmenere—hard to get much more Chilean than that! And the word “alma” means “soul” in Spanish, and the idea appealed to me. 2010 really was rough; it built character—it “strengthened our constitution” (as a close friend would say), and I’m truly hopefully that 2011 will have more heart, more soul. Chile’s collective “alma” could use a boost and Las Almas was a strong contender. But then there was Antiyal. Son of the Sun in Mapudungun, the language of Chile’s native Mapuche peoples. 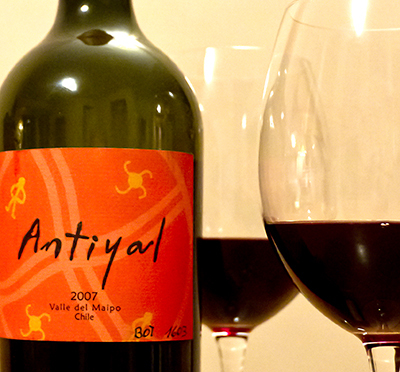 A biodynamically made wine from carefully tended grapes in Maipo Alto. A wine that I have an emotional bond with. I know the owners—organic/biodynamic guru-winemaker Alvaro Espinoza and his wonderful wife Marina Ashton—and have been to the winery many times—have even danced on the roof by the light of the moon. Biodynamics works by recognizing the very close tie between the earth and the cosmos, and after a year in which Mother Nature was very restless, it just seemed right to invoke the Son of the Sun to appeal to her good nature for a calmer, more peaceful 2001. Antiyal 2007 it was then. Don’t get me wrong. This is not just about emotions. This is one exceptional wine from Maipo Alto. Thick deep plum-red legs dribble slowly down the glass as aromas of rich, dark fruit waft out of it. Blackberries, plum, prune, with a pinch of spice, licorice, and hint of leather on the complex and heady nose. No need to stop there! It’s lush and juicy with more plum and blackberry on the palate, with a wonderfully long finish. The tannins are there-but nicely balanced and sure enough of themselves to make their presence known without stealing the show. My tasting notes say “a ripple of muscle under a flowing silk shirt” (Can you tell I’d been watching Chinese movies?). Delicious acidity keeps all that richness bright and juicy, although the alcohol is high enough that I put it in the fridge on this warm summer evening (New Year’s is summer here in Chile) to bring the temperature down to a very pleasing 16ºC / 60º-ish F.
Unfiltered and made with 100% organically grown, biodynamically managed grapes.